A restful night’s sleep makes for happy and healthy children and parents! If your new year’s resolution is to get more sleep, perhaps those late night wake-ups from babies and young children in your house is what’s causing sleep disruptions for both of you. I am a huge fan of white noise and have been using them in both my kids’ rooms since they were born. 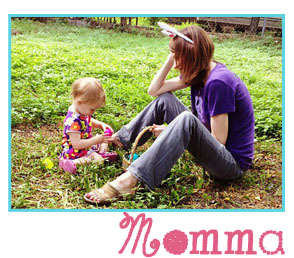 It gives the girls something to listen to and relax at bedtime when they’ve spent all day in preschool and 2nd grade, too! 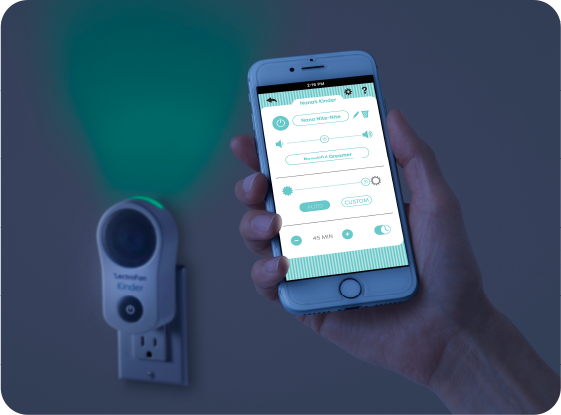 White noise machines are getting smarter and Adaptive Sound Technologies Inc. has created a new plug-in sound and light machine that can be programmed through your phone and made especially for young children so the entire family can get their ZZZs. Awesome! Adaptive Sound Technologies Inc., the leading supplier of sleep sound machines, announced their newest product last October 2017, the LectroFan Kinder. LectroFan Kinder is a first-of-its kind plug-in sound and light machine that features white noise, fan sounds, nature sounds and lullabies, as well as a nightlight. 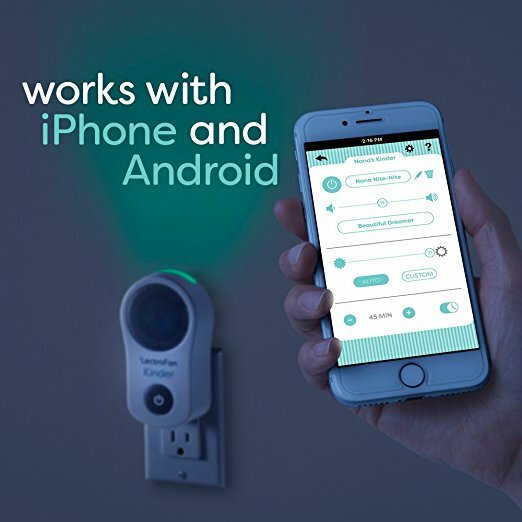 Using the free iOS or Android smartphone app from any room in the house to minimize disturbances, parents can control the sounds, volume, night light color and brightness of the LectroFan Kinder for complete customization. The LectroFan Kinder is designed with unique features to create an effective, sleep-inducing environment, including a myriad of relaxing sounds and lullabies in a compact size without sacrificing audio quality. 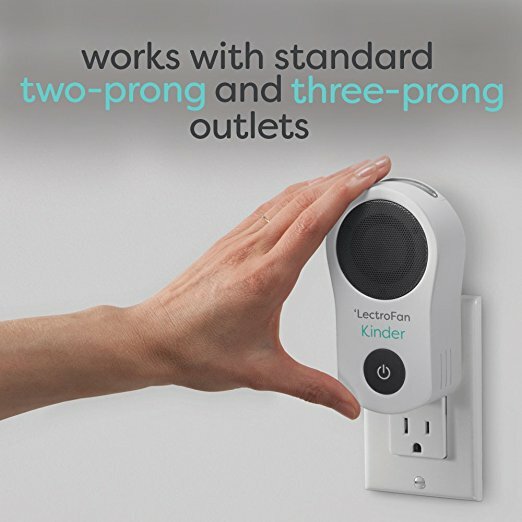 LectroFan Kinder is designed to fit well with any nursery or bedroom décor and plugs directly into a wall outlet without an additional cord, for safety. With a wide array of soft light, night light colors to choose from, parents can create an experience conducive to a great night’s sleep. There are over 75 sounds including lullabies, as well as non-looping nature, white noise, pink noise, brown noise and fan sounds to create unique soundscapes to gently lull a child to sleep. LectroFan Kinder uses naturally recorded sounds that constantly evolve and never repeat, for a real world natural sound experience that is different from any other sound machine on the market. Works with iPhone and Android. No Wi-Fi or internet connection required. About Adaptive Sound Technologies Inc.: Adaptive Sound Technologies Inc. is bringing relief to the estimated 50-70 million adults across America who need more consistent, quality sleep by making the only digital, non-looping sleep sound machine on the planet. Founded by industry leaders with diverse tech backgrounds, the Silicon Valley company is improving how people fall asleep with top-selling brands, Sound+Sleep and LectroFan. Learn more at www.soundofsleep.com. The LectroFan Kinder is now available for purchase at soundofsleep.com for $79.95.